Gene lives and records in the Austin area, and he tours (and records) with Dale Watson and His Lonestars. 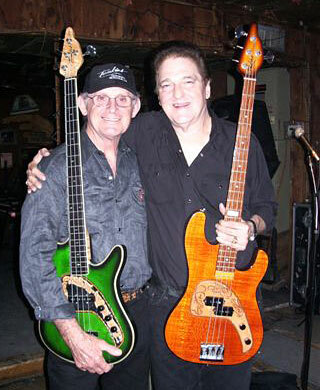 He is pictured left with Allan Tomkins at the Cash cabin Nashville, 2006. Gene co-wrote the internationally known hit song Treat Her Right, recorded by Roy Head and the Traits, Otis Redding, Mae West, Roy Buchanan, Jerry Lee Lewis, LeRoi Bros., Barbara Mandrell, George Thorogood, Arlen Roth, Johnny Thunders, Bob Dylan, The Box Tops, The Commitments, Los Straightjackets, Billy Crash Craddock, Len Barry, Sandy Nelson, Willie Mitchell, Nine Below Zero, Jamie Hartford Band, Bon Jovi, Bruce Springsteen, Shelby Lynne, Rory Gallagher, The Tragically Hip, Paul Shaffer, Mark Lindsay, Shoe Suede Blues, Shakin' Stevens, Robert Plant, and many others.